Water is definitely one of the most essential elements for humans, and thus it would be difficult to underestimate the influence of its properties on the quality of our life. Depending on the content of minerals in it, water is classified as hard or soft. The high content of mineral ions in drinkable water is often beneficial for human health; nevertheless excessive amounts of minerals are harmful not only to a human body but also for household appliances. Too much calcium and magnesium contained in water decrease soap lathering, cause hair and skin dryness and can spoil pipes and especially plumbing fixtures. To remedy such problem, the devices generally known as water softeners were designed. And again there appeared a great demand for portable versions since most hikers and RV travelers often face problems with hard water on camping sites. 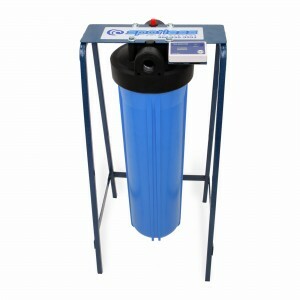 On such occasions portable water softening systems appear to be irreplaceable. Portable water softeners are usually characterized by compact dimensions and the simplicity in use. They soften small portions of water on site from local sources and often have an additional effect of filtration. Just exactly like traditional household water softening systems they usually use ion resin, replacing minerals with sodium ions. For this purpose, normal salt is required, as it contains sodium, being the key ingredient in the process of softening. As in the process of softening salt is dissolved, it needs to be replenished from time to time. Many portable softeners do not require electrical power for their work while their dimensions allow to position them in any recreational vehicle. We have listed the best options among portable water softeners highlighting their key benefits. Watts RV PRO-1000 OR M7002 is rightfully regarded as the best pick for RV travelers as it’s ultimately easy both in use and installation. It has the capacity of 10,000 grains and operates on ordinary table salt, relieving you from the necessity to buy a special water softening salt. It’s also noted for its compact size of just 21x9x9.5 inches. Thus it also isn’t bulky, what is always a plus on an RV travel. Along with the above characteristics, this device is the absolute leader in terms of positive reviews. Its lucky owners report that they do notice the considerable reduction of scale on their household appliances. They also mention that the water softened with it is much better both for their hair and skin, and doesn’t leave spots or film on their dishes. 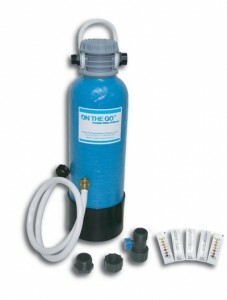 On the Go Water Softener is yet another popular device with excellent reviews. With the almost similar size of 22×6.5 inches and the weight of 18 inches, it does a great work at water softening, being able to process about 320-800 gallons. Its capacity is 8,000 grain and it also uses standard table salt. It’s affordable and easy to use, and will become a true helper, removing odor, improving the taste of the water and increasing soap lathering. And what is more important, increasing the lifespan of your appliances through the reduction of scale formation. It’s just another great pick with well-deserved popularity. Among portable water softening systems those designed for washing cars deserve special notice. Such systems both improve the look of your vehicle putting the end to spots due to hard water and protect the car’s finish against mineral buildup. Such portable water softening devices are usually attached between a garden hose and a spray nozzle. The most popular models in this category are the following ones. 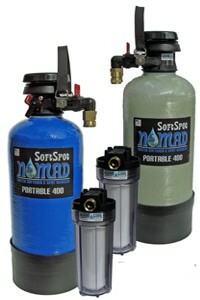 SoftSpot Nomad Portable 400 is also one of the most popular softeners solving the problem of mineral buildup spots. It has a convenient nylon handle and is characterized by truly fast regeneration speed with only 15 minutes being enough for it. This softener is capable of regenerating of up to 2,400 gallons while its technology is noted for the absence of improper backwash, flushing, and channeling. The unit needs water softening salt for its operation. 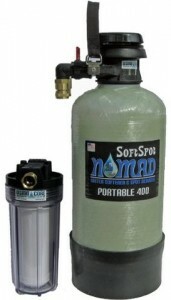 SoftSpot Nomad Portable RV Water Softener & Spot Reducer is also worth mentioning. It is quite similar to the above model in terms of all key characteristics. At the same time, it regenerates faster, taking only 10 minutes for high-quality output, though its capacity is also smaller, making up to 1,200 gallons. 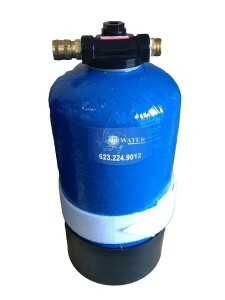 ABC Water Equipment Water Softener has also gained its portion of popularity among RV enthusiasts. Its capacity is higher as compared to other models, and yet its price remains agreeable and affordable. Its capacity is 12,800 grain, but it also means that it has more weight and is larger than other models. For spot-free vehicle washing, most users prefer DI-120 CR Spotless Water System, which has been designed especially for this purpose. By using a special de-ionizing system, it removes all minerals from the water to ensure ultimate protection of a vehicle’s finish against spots. This system is loved for its affordable price, convenience, and easy portability. One resin cartridge used in it can regenerate from 75 to 1000 gallons; the result will largely depend on the initial hardness of the water. A total dissolved solids meter comes included for you to be able to control the quality of the produced water. House windows, cars, boats, motorcycles, and RVs will surely get much cleaner as you use this device. 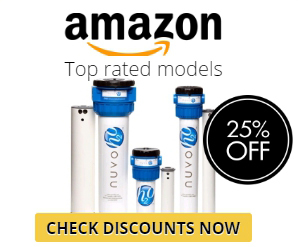 So if you are eager to increase the lifespan of your appliances, plumbing fixtures and vehicles and handle the problem of poor soap lathering, as well as to treat your hair and skin with softer water not only at home, but also on your travels, enjoying the convenience of portable devices, you definitely should consider one of the above models.